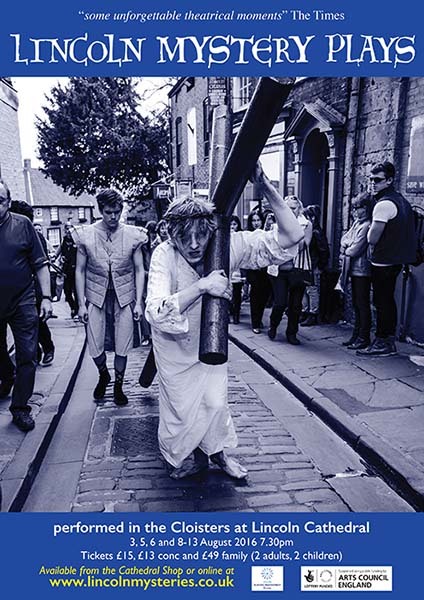 The Lincoln Mystery Plays have been an important part of the social and cultural fabric of the City of Lincoln for centuries. Evolved from scripture into a series of vignettes telling the Christian stories of both the Old and New Testaments and performed by Guilds, workers from different skilled industries, they became an integral part of how Christianity was understood, taught and how Christian belief is spread and consolidated in the community. Through these years of performance and refinement, the text of the plays have become much more. The plays highlight the humanity of the characters: Joseph expresses doubts and jealousies; Peter despairs as he denies Jesus; Jesus himself pleads to be released from the burden of his mission. What we have, as a result, is so much more than a religious morality play. The plays demonstrate the difficulties, the pain and sorrow, the strength and weaknesses of our human existence, thereby making the remarkable single-mindedness of Jesus the man a relevant and moving portrait of the battle to follow a pre-determined path. There is a deep spiritual and emotional core to The Mystery Plays; they speak to the humanity in the all of us. On tour with the plays I have witnessed wailing, distressed Italian women apparently inconsolable at the treatment of Jesus on stage; I have spoken with amused and pleasantly surprised clerics who thoroughly enjoyed the plays; and I have met agnostics who have been deeply moved by the universal nature of the Jesus story and its resonance with modern life. It is this universality, this appeal to all, which is so special with the ‘N’-Town Cycle. Jesus is presented as a man of innocence and truth, a radical who practices the tenets of his own preaching to the letter, a man of peace and tolerance in a world of military occupation and social chaos, a man treading the path laid out in prophecy, whose every step must be taken deliberately on a pre-ordained course from which he cannot deviate. This inability to avoid fate by one’s own actions is the very essence of Tragedy and inhabits all great storytelling throughout the ages. Our production allows the story to tell itself simply and with great empathy, with specially arranged music to accompany and impel the action, and with a vivid visual language which will bring the story to life. Set simply on a large open stage, the action unfolds like illustrations from a Children’s Bible; Jesus is born into an occupied country and sets out on the route of prophecy – like being constrained to ever walk a circle – knowing that to make one false step puts in jeopardy all that he hopes to achieve. “If thou to me will bend thy knee; And be content to worship me; This great round world that ye do see; I shall give to thee.” A speech by Lord Voldemort? No. It’s actually a plea from Lucifer to Jesus in the Lincoln Mystery Plays. I was wondering how much I’d really enjoy two and a half hours watching the portrayal of Bible stories, but actually these tales lack nothing of the ingredients of a blockbusting thriller – good guys, baddies, a fight against evil. Devout Christian or not, I challenge you not to be on the edge of your seat by the end of the second half – which I enjoyed twice as much in terms of performance and drama than the first. The first half lacked a little pace at times until we arrived at The Massacre of the Innocents. If your pulse isn’t racing and you don’t have a tear in your eye as King Herod’s men close in on the mothers and their babies, I question if your heart is beating. This is a non-professional production, and with the gravitas of the narrative it’s hard not to expect a little too much maybe from the amateur cast. Having said that a few performances really stood out. Lucifer, played by Henry Deighton, stole the show – an absolutely fantastic portrayal. Michael Freestone as Death will have the hairs on the back of your neck standing up, and Su Toogood as Mary at the foot of the cross will break your heart. Finally, a deserved mention for the live musicians adding so much to an audience experience. The Company are- Dominic Freestone, Anita Quigley, Charlie Seeley, Ruth Andrews, Dene Woodman, Henry Deighton, Shelagh Gillingham, Michael Mortimer, Vicky Bankes-Price, Michael Church, Andrew Cox, Carolyn Jones, Su Toogood, Katie Greathead, Gail Dennis, Jason Hippisley, Edmund White, Jack Lane, Jessica Hocking, Freya Blackwood, Sophie Halse, Michael Freestone, Mikey Evans, Lindsay Slapp, Mary Scott, Pamela Marnie, Christopher Matthews and Bertie Hippisley.